Although the function of tonsils is not completely understood, most experts believe they play an important immune system role early in childhood. Tonsils are comprised of cells called lymphocytes. In children, these cells produce antibodies that help prevent respiratory illnesses. They gradually shrink by the time a person reaches puberty, although they never entirely disappear. The location of the tonsils enables them to trap incoming germs (viruses and bacteria). 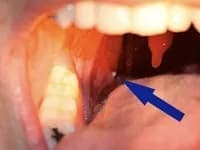 Although the immune function of tonsils may no longer ward off illness in adults, they can become inflamed due to the debris and bacteria they capture. When this occurs, tonsillitis may result. In severe and recurring cases, removal of the tonsils (tonsillectomy) may be necessary. 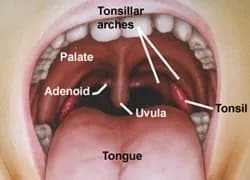 The formation of tonsil stones is caused by an accumulation of sulfur-producing bacteria and debris that become lodged in the tonsils. The debris may include food particles and mucus from postnasal drip. This matter decays in the back of the throat and collects in the small crevices (crypts) on the surface of the tonsils. The affected area attracts additional debris and after enough accumulates, it begins to calcify, resulting in hard white or yellow formations. In some cases, a single large stone will form on a tonsil, while in other cases, multiple small stones will appear. The debris that comprises a tonsil stone comes from many sources, but does not require the presence of a tonsil infection to form. While tonsil stones may be or may not result from tonsil inflammation, there is evidence they occur more frequently in people who have repeated bouts of tonsillitis. The National Center for Biotechnology Information found that 75% of patients with high amounts of sulfur in their mouth (a leading cause of bad breath) had tonsil stones. A Japanese study published in 2014 uncovered a higher incidence of tonsil stones than prior studies. Of 482 individuals, 222 (46.1%) had tonsil stones based on CT scans while only 37 (7.7%) had tonsil stones based solely on panoramic radiographs. Tonsil stones typically occur in adults between the ages of 20 and 40 and affect an estimated 6 to 10% of people in the U.S. annually. Doctors have removed tonsil stones ranging from .10 ounce to as large as 1.5 ounces. Tonsil stones are often not visible to the naked eye because tonsils have twists and folds that provide a hiding place for stones to form. The organic nature of the stones also makes them difficult to detect. Due to their small size and the structure of the tonsils, they may not be visible, even when the mouth is wide open. Tonsil stones are often diagnosed coincidentally during dental x-rays or CT scans. After a period of time, it is not uncommon to cough up small, hard whitish spheres, which are stones that have dislodged from your tonsils. Tonsil stones are not as hard as organic stones and will not cause damage if swallowed accidentally. When tonsil stones combine with the volatile sulfur compounds produced by bacteria beneath the surface of the tongue, they can cause chronic and severe bad breath (halitosis). If you have bad breath that does not improve with the use of regular toothpastes, mouthwashes and other products, you may have tonsil stones. The stones may cause difficulty swallowing, especially when they are large or the tonsils are inflamed. Most people whose tonsils have been removed will not develop tonsil stones. However, having tonsils removed is not a practical or optimal solution in most cases. Tonsil removal in children is relatively risk-free. However, adults who undergo tonsillectomies often experience longer recuperation times, greater pain, and occasional problems resulting from adverse anesthesia reactions. Unless tonsil stones are manually removed or prevented, bad breath will persist. This problem may become so severe that a person is too ashamed to interact with friends or family. Fortunately, there are several things you can do to help prevent tonsil stones from forming without having your tonsils removed. TheraBreath products contain natural and oxygenating ingredients that help prevent tonsil stones and bad breath. TheraBreath's Tonsil Stones Deluxe Kit contains everything you need to attack sulfur-producing bacteria while helping to improve overall oral health. The combination of these products will result in a clean, oxygen-rich, pleasant-smelling environment. TheraBreath Plus Nasal-Sinus Drops help prevent tonsil stones by oxygenating the sinuses and back of the throat with the power of OXYD-8. They are also a great choice for people who suffer from bad breath due to allergies, postnasal drip, and chronic dry mouth. If you want to prevent bad breath and tonsil stones on a long-term basis, you must use oxygenating toothpaste, mouthwash, and a tongue cleaner to effectively neutralize the anaerobic bacteria from the back of the tongue. This twice-daily regimen will help prevent tonsil stones from recurring. Many patients who have followed the recommended regimen using TheraBreath oxygenating products have reported great success combatting tonsil stones and preventing their recurrence. In fact, some patients have reported results in as little as one day after starting treatment. Click here to download our handy Tonsil Stones booklet.